Dogs are intelligent, thinking creatures – and the more opportunities they have to use their skills and learn through kind methods of training the better. 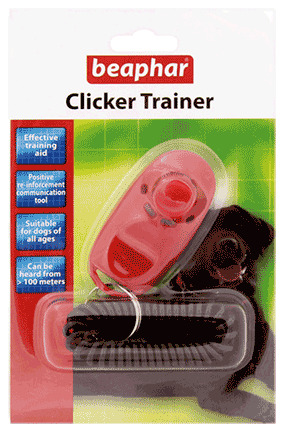 The Beaphar Clicker Trainer is one of the most modern, effective and enjoyable methods available, and suitable for all sizes and breeds of dog. Based on sound scientific principles, it will allow you to effectively communicate with your dog and train him to perform both basic obedience and also more complicated tasks. It is ideal to use whenever introducing a new exercise or trick. As a positive re-enforcement tool the Clicker Trainer is effective up to 100 metres, and will allow you to further bond with your dog when you praise them for returning upon the click. When pressed and released the clicker makes a distinctive ‘click, click’ sound, which when used in conjunction with rewards (food, play or affection) can be taught to have a positive meaning to your dog. There are currently no questions for Beaphar Clicker Trainer - be the first to ask one!